In a piece on the DEA dragnet the other day, Julian Sanchez made an important point. The existence of the DEA dragnet — and FBI’s use of it in previous terrorist attacks — destroys what little validity was left of the claim that NSA needed the Section 215 dragnet after 9/11 to close a so-called “gap” they had between a safe house phone in Yemen and plotters in the US (though an international EO 12333 database would have already proven that wrong). First, the program’s defenders often suggest that had we only had some kind of bulk telephone database, the perpetrators of the 9/11 attacks could have been identified via their calls to a known safehouse in Yemen. Now, of course, we know that there was such a database—and indeed, a database that had already been employed in other counterterror investigations, including the 1995 Oklahoma City bombing. It does not appear to have helped. But the DEA dragnet is even more damning for another set of claims, and for another terrorist attack such dragnets failed to prevent: former DEA informant David Headley, one of the key planners of the 2008 Mumbai attack. As ProPublica extensively reported in 2013, Headley first got involved in Lashkar-e-Taiba while he remained on the DEA’s payroll, at a time when he was targeting Pakistani traffickers. Indeed, after 9/11, his DEA handler called him for information on al Qaeda. All this time, Headley was working phone based sources. Headley began collecting counterterror intelligence, according to his testimony and the senior DEA official. He worked sources in Pakistan by phone, getting numbers for drug traffickers and Islamic extremists, according to his testimony and U.S. officials. Even at this early stage, the FBI had a warning about Headley, via his then girlfriend who warned a bartender Headley had cheered the 9/11 attack; the bartender passed on the tip. And Headley was providing the DEA — which already had a dragnet in place — phone data on his contacts, including Islamic extremists, in Pakistan. ProPublica’s sources provide good reason to believe DEA, possibly with the FBI, sent Headley to Pakistan even after that tip, and remained an informant until at least 2005. So the DEA (or whatever agency had sent him) not only should have been able to track Headley and those he was talking to using their dragnet, but they were using him to get phone contacts they could track (and my understanding is that agreeing to be an informant amounts to consent to have your calls monitored, though see this post on the possible “defeat” of informant identifiers). Did Headley’s knowledge of DEA’s phone tracking help the Mumbai plotters avoid detection? Maybe. 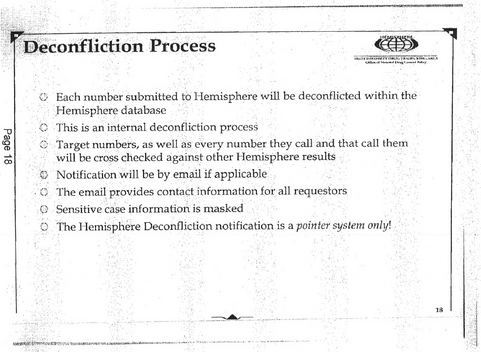 And/or maybe Headley taught his co-conspirators how to avoid detection. Of course, Headley could have just protected some of the most interesting phone contacts of his associates (but again, DEA should have tracked who he was talking to if they were using him to collect telephony intelligence). More importantly, he may have alerted Laskar-e-Taiba to phone-based surveillance. In a December joint article with the NYT, ProPublica provided details on how one of Headley’s co-conspirators, Zarrar Shah, set up a New Jersey-based VOIP service so it would appear that their calls were originating in New Jersey. Not long after the British gained access to his communications, Mr. Shah contacted a New Jersey company, posing online as an Indian reseller of telephone services named Kharak Singh, purporting to be based in Mumbai. His Indian persona started haggling over the price of a voice-over-Internet phone service — also known as VoIP — that had been chosen because it would make calls between Pakistan and the terrorists in Mumbai appear as if they were originating in Austria and New Jersey. Mr. Shah had begun researching the VoIP systems, online security, and ways to hide his communications as early as mid-September, according to the documents. Eventually Mr. Shah did set up the VoIP service through the New Jersey company, ensuring that many of his calls to the terrorists would bear the area code 201, concealing their actual origin. We have reason to believe that VOIP is one of the gaps in all domestic-international dragnets that agencies are just now beginning to close. And by proxying through the US, those calls would have been treated as US person calls (though given the clear foreign intelligence purpose, they would have met any retention guidelines, though may have been partly blocked in CIA’s dragnet). While there’s no reason to believe that Headley knew that, he likely knew what kind of phone records his handlers had been most interested in. But it shouldn’t have mattered. As the article makes clear, GCHQ not only collected the VOIP communications, but Shah’s communications as he set them up. 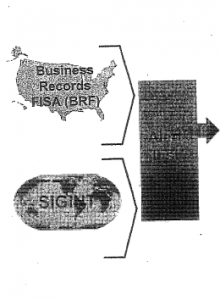 Did FBI claim it tracked Headley using the NSA dragnet when it had actually used the DEA one? I’ve been arguing for years that if dragnet champions want to claim they work, they need to explain why they point to Headley as a success story because they prevented his planned attack on a Danish newspaper, when they failed to prevent the even more complex Mumbai attack. Nevertheless, they did claim it — or at least strongly suggest it — as a success, as in FBI Acting Assistant Director Robert Holley’s sworn declaration in Klayman v. Obama. In October 2009, David Coleman Headley, a Chicago businessman and dual U.S. and Pakistani citizen, was arrested by the FBI as he tried to depart from Chicago O’Hare airport on a trip to Pakistan. At the time of his arrest, Headley and his colleagues, at the behest of al-Qa’ida, were plotting to attack the Danish newspaper that published cartoons depicting the Prophet Mohammed. Headley was later charged with support for terrorism based on his involvement in the planning and reconnaissance for the 2008 hotel attack in Mumbai. Collection against foreign terrorists and telephony metadata analysis were utilized in tandem with FBI law enforcement authorities to establish Headley’s foreign ties and put them in context with his U.S. based planning efforts. That said, note how Holley doesn’t specifically invoke Section 215 (or, for that matter, Section 702, which the FBI had earlier claimed they used against Headley)? Now compare that to what the Privacy and Civil Liberties Oversight Board said about the use of Section 215 against Headley. In October 2009, Chicago resident David Coleman Headley was arrested and charged for his role in plotting to attack the Danish newspaper that published inflammatory cartoons of the Prophet Mohammed. He was later charged with helping orchestrate the 2008 Mumbai hotel attack, in collaboration with the Pakistan-based militant group Lashkar-e-Taiba. He pled guilty and began cooperating with authorities. Headley, who had previously served as an informant for the Drug Enforcement Agency, was identified by law enforcement as involved in terrorism through means that did not involve Section 215. Further investigation, also not involving Section 215, provided insight into the activities of his overseas associates. In addition, Section 215 records were queried by the NSA, which passed on telephone numbers to the FBI as leads. Those numbers, however, only corroborated data about telephone calls that the FBI obtained independently through other authorities. Thus, we are aware of no indication that bulk collection of telephone records through Section 215 made any significant contribution to the David Coleman Headley investigation. While PCLOB doesn’t say any of these other authorities are DEA’s dragnet, all of them could be (though some of them could also be NSA’s EO 12333 dragnet, or whatever dragnet CIA runs, or GCHQ collection, or Section 702, or — some of them — FBI NSL-based collection, or tips). What does seem even more clear now than when PCLOB released this is that NSA was trying to claim credit for someone else’s dragnet, so much so that even the FBI itself was hedging claims when making sworn declarations. Of course, whatever dragnet it was that identified Headley’s role in Laskar-e-Taiba, even the DEA’s own dragnet failed to identify him in the planning stage for the larger of the attacks. If the DEA’s own dragnet can’t find its own informant plotting with people he’s identified in intelligence reports, how successful is any dragnet going to be? I will have far more to say about PCLOB once I finish my working thread. But there’s one glaring flaw in the report’s claim that the government complies with the statute. Based on the information that the Board has reviewed, the government’s PRISM collection complies with the structural requirements of the statute. But here’s the report’s discussion of what happens with aggrieved persons — those prosecuted based in information derived from Section 702 information. But for 5 years after the passage of the law, the government never once gave defendants notice they were aggrieved under Section 702. It lied to the Supreme Court about not having done so. And even while it has since given a limited number of defendants — like Mohamed Osman Mohamud — notice, there are others — David Headley, Najibullah Zazi and Adis Medunjanin, and Khalid Ouazzani — who are known to be aggrieved under Section 702 who have never received notice. Finally, there is the case of the Qazi brothers, which seems to be a case where the government is parallel constructing right in the face of the magistrate. PCLOB said that the government is generally in compliance with the statute. And yet, it made no mention of known, fairly egregious violations of the statute. That suggests the report as a whole may be flawed. One of my friends, who works in a strategic role at American Federation of Teachers, is Iranian-American. I asked him a few weeks ago whom he called in Iran; if I remember correctly (I’ve been asking a lot of Iranian-Americans whom they call in Iran) he said it was mostly his grandmother, who’s not a member of the Republican Guard or even close. Still, according to the statement that Dianne Feinstein had confirmed by NSA Director Keith Alexander, calls “related to Iran” are fair game for queries of the dragnet database of all Americans’ phone metadata. Chances are slim that my friend’s calls to his grandmother are among the 300 identifiers the NSA queried last year, unless (as is possible) they monitored all calls to Iran. But nothing in the program seems to prohibit it, particularly given the government’s absurdly broad definitions of “related to” for issues of surveillance and its bizarre adoption of a terrorist program to surveil another nation-state. 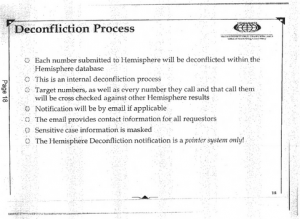 And if someone chose to query on my friend’s calls to his grandmother, using the two-degrees-of-separation query they have used in the past would give the government — not always the best friend of teachers unions — a pretty interesting picture of whom the AFT was partnering with and what it had planned. In other words, nothing in the law or the known minimization rules of the Business Records provision would seem to protect some of the AFT’s organizational secrets just because they happen to employ someone whose grandmother is in Iran. That’s not the only obvious way labor discussions might come under scrutiny; Colombian human rights organizers with tangential ties to FARC is just one other one. According to NSA officials, the surveillance in question has prevented at least 50 planned terror attacks against Americans, including bombings of the New York City subway system and the New York Stock Exchange. While such assertions from government officials are difficult to verify independently, the lack of attacks during the long stretch between 9/11 and the Boston Marathon bombings speaks for itself. Keith Alexander didn’t say NSA’s use of Section 702 and Section 215 have thwarted 50 planned attacks against Americans; those 50 were in the US and overseas. He said only around 10 of those plots were in the United States. That works out to be less than 20% of the attacks thwarted in the US just between January 2009 and October 2012 (though these programs have existed for a much longer period of time, so the percentage must be even lower). And there are problems with three of the four cases publicly claimed by the government — from false positives and more important tips in the Najibullah Zazi case, missing details of the belated arrest of David Headley, to bogus claims that Khalid Ouazzan ever planned to attack NYSE. The sole story that has stood up to scrutiny is some guys who tried to send less than $10,000 to al-Shabaab. While that doesn’t mean the NSA surveillance programs played no role, it does mean that the government’s assertions of efficacy (at least as it pertains to terrorism) have proven to be overblown. Yet from that, Nayman concludes these programs have “been effective in keeping us safe” (given Nayman’s conflation of US and overseas, I wonder how families of the 166 Indians Headley had a hand in killing feel about that) and defends giving the government legal access (whether they’ve used it or not) to — among other things — metadata identifying the strategic partners of labor unions with little question. And details about the success of the program are not the only statements made by top National Security officials that have proven inaccurate or overblown. That’s why Nayman would be far better off relying on Mark Udall and Ron Wyden as sources for whether or not the government can read US person emails without probable cause than misstating what HBO Director David Simon has said (Simon said that entirely domestic communications require probable cause, which is generally but not always true). And not just because the Senators are actually read into these programs. After the Senators noted that Keith Alexander had “portray[ed] protections for Americans’ privacy as being significantly stronger than they actually are” — specifically as it relates to what the government can do with US person communications collected “incidentally” to a target — Alexander withdrew his claims. Nayman says, “As people who believe in government, we cannot simply assume that officials are abusing their lawfully granted responsibility and authority to defend our people from violence and harm.” I would respond that neither should we simply assume they’re not abusing their authority, particularly given evidence those officials have repeatedly misled us in the past. I just finished watching the House Intelligence Committee hearing on the NSA programs revealed by Edward Snowden. I’ll have a lot more to say about the content of the revelations in the next few days. But first, a general observation. Since the initial Snowden revelations, the Intelligence Community and other Administration surrogates have been trying to minimize our understanding of the scope of their surveillance and use traditional fearmongering to justify the programs by focusing on the importance of the Section 702 collection to stopping terrorism. While James Clapper’s office has made it clear that Section 702 goes beyond counterterrorism by revealing that its successes include counterproliferation and cybersecurity successes, as well as counterterrorism ones, the focus has nevertheless been on TERROR TERROR TERROR. Today’s hearing was really the culmination of that process, when Keith Alexander boasted up upwards of 50 terrorist plots — about 40 of which were overseas — that Section 702 has prevented. … the government has either overblown the importance of these programs and their success or are fairly minor plots. None of the four may be as uniquely worthwhile as the cyberattack described by Clapper’s office a week ago, which it has not, however, fleshed out. That is, the government might–might!–be able to make a far better case for the value of these programs in discussing their role in preventing cyberattacks rather than preventing terrorist plots. And yet it hasn’t done so, even as it pushes one after another attempt to legislate internet access in the name of protecting Intellectual Property and critical infrastructure. Given the increasing focus on cybersecurity — and the already dishonest claims people like Mike Rogers have made about the means to accomplish that focus — this is the discussion we need to be having, rather than digging up terror plots first developed in 2004 that never happened. But in the same way the government shied away from conducting an honest discussion with us in 2001 and again in 2006 about these programs, it is refusing to conduct an honest discussion about cybersecurity today. And, ironically, that refusal is preventing them from describing the value of a program that surely contributes more to countering cyberattacks than terror attacks at this point. I will have far, far more to say about the claims about the various surveillance programs aired on the Sunday shows today. But this is absolutely batshit crazy. FEINSTEIN: Well, of course, balance is a difficult thing to actually identify what it is, but I can tell you this: These programs are within the law. The [Section 215] business records section is reviewed by a federal judge every 90 days. It should be noted that the document that was released that was under seal, which reauthorized the program for another 90 days, came along with a second document that placed and discussed the strictures on the program. That document was not released. So here’s what happens with that program. The program is essentially walled off within the NSA. There are limited numbers of people who have access to it. The only thing taken, as has been correctly expressed, is not content of a conversation, but the information that is generally on your telephone bill, which has been held not to be private personal property by the Supreme Court. Dianne Feinstein says that one of the two plots where Section 215 prevented an attack was used (the other, about Najibullah Zazi, is equally batshit crazy, but I’ll return to that) is the Mumbai attack. What’s she referring to is tracking our own informant, David Headley. And it didn’t prevent any attack. The Mumbai attack was successful. Our own informant. A successful attack. That’s her celebration of success 215’s use. So her assertion is we need to collect metadata on every single American because DEA can’t keep control of its informants. Update: Technically DiFi didn’t say this was a success, just that it had been used. I’ve edited the post accordingly.